Cassandra Burrier serves as administrative assistant for the Information and Technology Dissemination division and the front desk at MBARI. 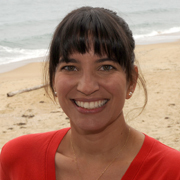 Before joining MBARI Cassandra worked at Monterey Bay Aquarium for eight years as an education programs lab technician and bilingual education specialist. Prior to the Aquarium, Cassandra held education programs assistant and executive assistant positions at various organizations in her home state of Florida. Cassandra earned a Bachelor’s degree in environmental studies from Florida State University and went on to receive a Master’s degree in coastal environmental management from the Nicholas School of the Environment at Duke University.